Overview: Welcome back to the continuing adventures of the Man without Fear. By day, Matt Murdock is a trial attorney, working to see that everyone has a chance to have their case heard in court. By night, Murdock dons his red fighting togs to become Daredevil. Many of Daredevil’s foes (Stilt-Man, Ani-Men, Marauder) from the first Essential volume return for another go at our hero, but we see that circle of opponents expand out into the Marvel Universe. Daredevil crosses paths with Doctor Doom, the Beetle, the Trapster, the Cobra and Mr. Hyde. Of course, you can’t have those villains without the obligatory guest appearances by the Fantastic Four, Spider-Man, and Thor as well. One new foe is introduced, as the Jester makes his first appearance in these pages. We also get a new focus on Matt’s law partner, Foggy Nelson. He is once again recruited to run for District Attorney. Matt doesn’t completely approve of this move, because the campaign pulls Foggy’s attention away from the firm. Ironically, Matt needs Foggy to be focused on the firm, because Matt’s time and attention is split by his role as Daredevil. This volume ends with Foggy winning the election, but perhaps splitting up the firm and their friendship as Murdock walks away. What makes this Essential? : This volume is where things really start to take off for Daredevil. Stan Lee starts to stretch stories out across multiple issues, allowing the tale to develop and not feel rushed. (Sure, one could complain about the absurdity of the entire Mike Murdock storyline, which only shows how blind Foggy Nelson and Karen Page must have been.) The art by Gene Colan is simply breathtaking for the time. His characters look and feel alive within the panels. In fact, Colan’s human figures (Matt, Karen, Foggy) are much better than any of his costumed figures (Daredevil). This essential is worth picking up just for the Colan artwork. Footnotes: Fantastic Four #73 is also collected in Essential Fantastic Four Vol. 4. If you like this volume, try: the Daredevil: Guardian Devil storyline from Kevin Smith, Joe Quesada, and Jimmy Palmiotti from 1998. This was the first mainstream comic for the comic-fan-turned-film-director. 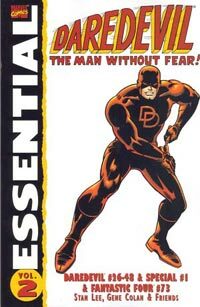 In turn, this storyline brought in many of Smith’s fans into the world of Daredevil for the first time. In 1998, Marvel announced a project dubbed “Marvel Knights”, which would create more adult-oriented material using established Marvel characters, such as the Punisher, the Black Panther, and Daredevil. With this, Daredevil’s first series was ended with issue #380, and the series was relaunched with a new #1 issue under the Marvel Knights banner. In the story, Daredevil finds himself protecting a young baby, who might be the Messiah, or might be the Anti-Christ. This has been collected in numerous trades and hardcovers, so it should not be too hard to track down. This entry was posted in Daredevil, Marvel Essentials and tagged Daredevil, Gene Colan, Stan Lee. Bookmark the permalink. I’ve never read much Silver Age Daredevil past the first three or four issues, but I just got the first three softcover Masterworks. I can’t wait to experience some of the great Gene Colan artwork in the later volumes!